ARCTIC RACE FRONT SUSPENSION: The Arctic Race front suspension’s geometry was developed through racing. Our unique wide A-arm spacing complements the chassis design, which allows us to maintain a tighter suspension. Hydraulic twin tube shocks provide the dampening to smooth out the whoops and bumps. SLIDE-ACTION REAR SUSPENSION: The SLIDE-ACTION Rear Suspension™ brings race-day technology to everyday riding. Our U-shaped slot fits over a fixed shaft to allow a crucial half-inch of sliding movement. 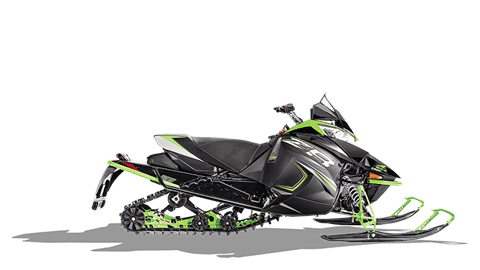 As the rear transfer blocks are engaged, the free-acting front arm follows the terrain, keeping your skis firmly planted over bumps and during aggressive cornering and acceleration. This significant detail controls ski lift during acceleration. Arctic Cat® hydraulic twin tube shocks smooth out the chatter, mile after mile, for an even more comfortable ride. 129 IN. RIPSAW & 137 IN. RIPSAW II TRACK WITH 1.25 IN. LUGS: Just say the name Ripsaw™ and one of the best trail tracks out there comes to mind. The 15 in. wide footprint with 1.25 in. 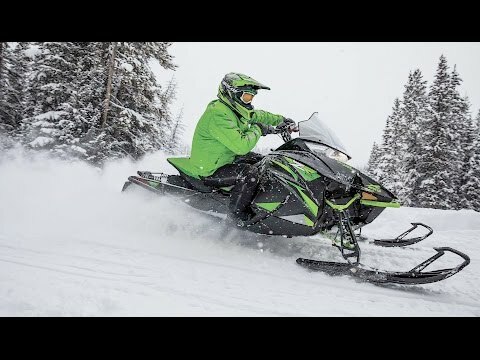 lugs provide excellent durability and traction on groomed or hard-pack snow. Standard Ripsaw is available in 129 in. or the Ripsaw II is available in 137 in.